He was born, the first of six sons, into a wealthy French family. Against his family wishes he decided to become a priest. This followed a personal struggle with his own conscious and what he believed were signs from God. He is remembered as a friend of the poor, his reputation as a ‘spellbinding preacher’ and of course, his many pertinent spiritual writings. St Francis is the Patron Saint of writers as well as the deaf, having developed a sign language to teach a deaf man about God. His Feast Day is 24th January. Obtain also the favour for which I now pray: (State your request… ). 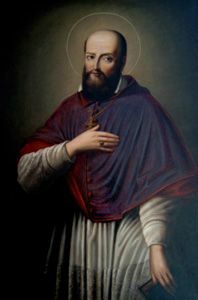 Let us pray: O God, who for the salvation of souls, did will that St. Francis de Sales should become all things to all men and women, mercifully grant that we, helped by the gentleness of his charity, guided by his teachings, and sharing in his merits, may obtain eternal happiness. This we ask through Christ our Lord. Amen.